As people know Michael Jackson came to Taiwan in 93' for the Dangerous Tour. What many people may not be aware of was that before he began the Asian leg of the Dangerous tour, he briefly flew into Taiwan before departing to Bangkok for his first concert. 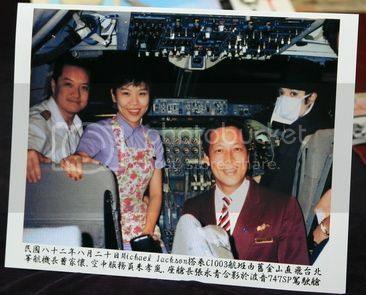 He flew China Airlines, a Taiwanese based company. The China Airlines "Dynasty Magazine" featured Michael in their October issue, it was not only about his Taipei concert, but also revealed details of him as the the airline's secret VIP passenger. Possibly to confuse the press, instead of flying his own private jet to Bangkok, Michael set off for Bangkok a day earlier than planned, via San Francisco to Taipei for the connection flight to Bangkok. 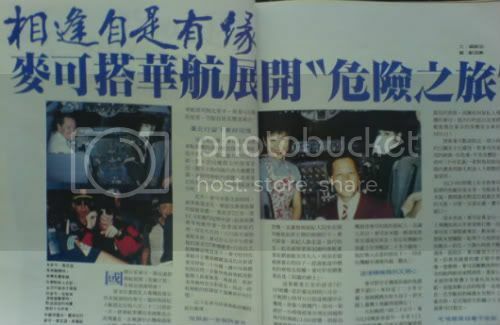 To avoid the unnecessary press attention, the schedule was kept confidential, it was only leaked to the Taiwanese press the next day by passengers who recognised Michael, and later confirmed by the Airlines. 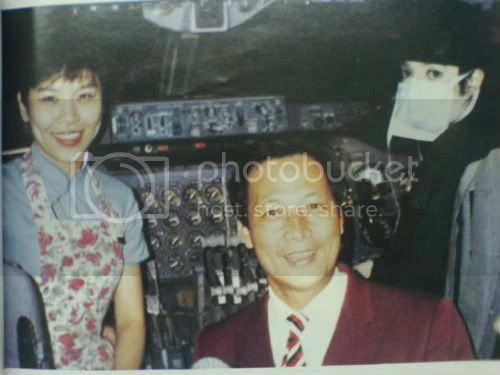 Without anyone noticing, Michael Jackson was the last passenger at the last minute to board the China Airlines CI-003 from San Francisco wearing his hat and surgical mask. He sat at the front by the window in the first class cabin with his agent (Michael's security Bill Bray). He arrived at the Taiwan Taoyuan International Airport around 19.30pm on 21st August. Michael was greeted on board by the company head of the public relations Mr. Luo and other senior members before they briefly took a walk "sightseeing" the transfer area. Luo recalled that Michael kept praising the display of the hallway, walking back and forth a few times, excited like a big kid, he seemed to be very happy to be on the island of Taiwan for the first time. Mr. Luo spent nearly an hour talking with Michael, he later spoke of his amazement at how child like, well mannered and easy going that he was. Michael's long thick eyelashes and charming big brown eyes were most memorable. 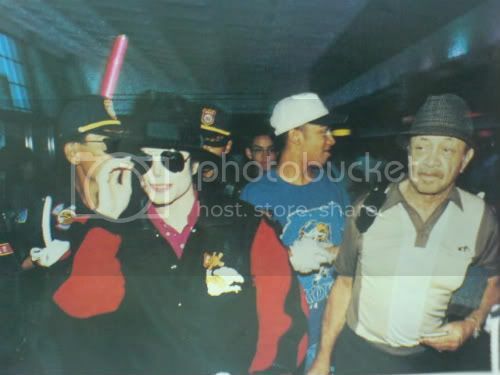 At 20.30 before all other passengers, Michael boarded the next plane CI-065 heading to Bangkok, unknown to the cabin crew. As usual they were busy preparing for taking off, when they unexpectedly saw Michael, the whole crew were in complete disbelief! Michael who apparently owned 4 private jets, recognised the plane that he was traveling in as the brand new MD-11! However, the first crew members on the CI-003 included chief cabin Mr. Zhang, air attendance Ms. Zhu and Ms. Liu who had flown in with the pop icon via San Francisco, they felt exceptionally honoured to meet Michael. All complimented on his charm and good manners after spending time with him on the long haul flight. Zhang recalled that after Michael boarded the plane, he expressed his wish to catch up on some sleep, as he had not slept the previous night due to various things to do with his tour. After the plane took off, he soon fell asleep for 5-6 hours. Zhang was surprised that a super star such as Michael Jackson, appeared to be so kind, pure and innocent, which was beyond his expectation. After Michael woke up, he went into the kitchen to check things out and chatted to everyone, he even got himself some children's toys and stickers. There was no doubt that he really adored children, when he was asked to sign a photo of an air attendant's two year old daughter, Michael took as long as 5 seconds looking at the photo before putting the pen down. Zhu said that the crew were excited to meet Michael, but only herself alongside with colleague Liu were privileged to look after him. Michael chatted to them a lot, and often showed his appreciation for their work. Michael was not a big eater, he preferred vegetarian food, so he didn't eat much on the flight. He mainly accepted almonds and peanut type snacks. Zhu said Michael wasn't fussy about wine glasses, he had white wine in a coffee cup, and only had an apple and yogurt for breakfast. The crew also noted his caring side, when he woke up in the dark just before breakfast, trying not to disturb other passengers while looking out of the window, he thoughtfully covered up his head and the window with a blanket to stop the light coming in. Apart from a few hours sleep, the rest of the time Michael was actively chatting to the crew, looking through the window, playing poker with his agent and reading the airline magazine. He even bought a toy plane watch. The plane journey went very smoothly, Michael didn't forget to pay compliments to the chief pilot Mr. Cao. He cheered as soon as the plane landed, his child like spirit was contagious, all the other passengers were soon cheering along with him! Before getting off the plane, lots of passengers and the crew couldn't resist asking Michael for his autograph which he was happy to give. Senior air attendants later commented about their years of experience in dealing with international stars, Michael was the most sincere and approachable, something they would never forget! It was a very rare occasion for Michael to be on board a commercial flight. He was especially grateful for the excellent service he received from the flight attendants, and expressed that he would fly China Airlines again if the opportunity arose. In fact, his agent did just that the next day, by cancelling his original booking with other airlines and again flying with China Airlines back to the US! that took place on 04, 06 September 1993.